I'm an unabashed fan of willows (Salix spp.). Maybe it stems from imprinting on a large weeping willow (S. babylonica) growing behind my childhood home. Or, maybe it's because I'm awed by the streambank holding power of willows used in riparian restoration projects. How can you not respect the ability to spring forth from bundles of unrooted cuttings (a.k.a. sticks) stuck into streambanks? Their almost eternal thirst for survival makes them perfect partners in thwarting meandering streams. Besides that, few trees can match the wispy form of many willow species. Of course, no tree is perfect and willows have a few pests. Thankfully, the depth of their vital spark means willows are capable of handling the depredations of most pests. However, the pests I'm highlighting can make trees look bad. First generation Willow Sawfly (Nematus ventralis) larvae are chowing down on willows in southwest Ohio. Despite their common name, this non-native European sawfly may also feed on poplars (Populus spp.). The striking looking larvae are shiny black with a row of slightly raised orangish-yellow spots along the sides of their body. As with many types of sawfly larvae, when disturbed willow sawfly will form their bodies into an "S" shape (S for sawfly?). Don't confuse this species with another sawfly species found in North American that also feeds on willow. Nematus oligospilus has no approved common name; however, it is also commonly referred to as the "willow sawfly." Larvae of this species are much less colorful; their head capsules are flesh colored and their bodies are light green with faded green and white longitudinal stripes. 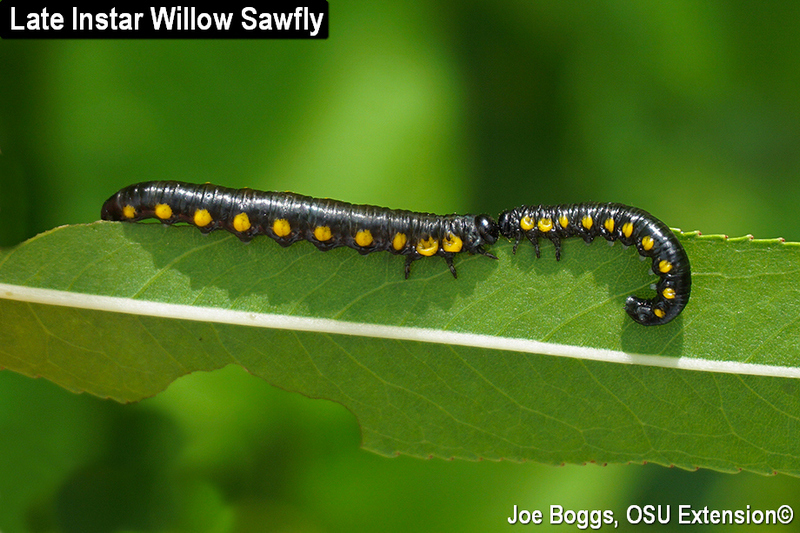 Willow sawfly larvae feed in colonies that typically include 5 - 10 individuals. Early instars produce holes and notches in leaves while late instars consume entire leaves except for the midveins. Heavy defoliation is rare, so this sawfly is seldom considered a serious pest of established willows. However, since this sawfly has two generations per season in Ohio, the impact of the second generation on newly planted trees may be significant. Control options include simply knocking the colonies into a bucket of soapy water or onto the ground and doing the "sawfly stomp dance." Doug Young (H. J. Benken Florist & Greenhouse) demonstrates this control option below. Thus far, no populations have become resistant to stomping. Appropriately labeled insecticides are also effective. However, remember that although sawflies look like caterpillars; sawflies are related to bees and wasps (order Hemiptera) and caterpillars grow up to become moths or butterflies (order Lepidoptera). Caterpillars can be killed with the naturally occurring bacterium, Bacillus thuringiensis serotype kurstaki (Btk). Sawfly larvae are unaffected by this bacterium. First generation Imported Willow Leaf Beetles (Plagiodera versicolora) are also feeding on the leaves of wild and cultivated willows in the southwest part of the state. This native of northern Europe has become well established throughout most of the eastern and Midwestern states. Although it has been a number of years since a significant outbreak has been reported in Ohio, this beetle has a history of periodically achieving population outbreak densities and causing significant defoliation of its namesake host. However, I'm only seeing relatively low, widely dispersed populations thus far this season. The small, 1/8" long, oblong-shaped beetles sport a bluish-black or bluish-green hue depending upon the angle of the light reflecting off these shiny beetles. They feed by chewing holes or notches in willow leaves. Their larvae feed side-by-side as leaf skeletonizers slowly moving across the upper or lower leaf surfaces. Heavy damage causes leaves to turn brown and appear scorched. Brightly colored wart‑like galls on upper leaf surfaces are now very evident on black willow (S. nigra) in southwest Ohio. The galls are generally ascribed to the Willow Leaf Gall Mite (Aculops tetanothrix, family Eriophyidae). Unfortunately, eriophyid mite taxonomy is far from complete. The mite belongs to a complex of gall-forming eriophyid species with the exact taxonomy uncertain. However, the bottom line is that these showy galls are not known to cause significant harm to the overall health of their willow tree host. In fact, I contend they actually enhance the ornamental value of black willow. Of course, while I love willows, I'm also a gall-oholic.